Posted on December 22, 2014 at 12:35 pm. From the world’s leading gaming software provider comes the latest branded pokies release just in time for the holiday season, giving players plenty of leisure time to get stuck into this incredible new online slots game. Those legends at Net Entertainment have teamed up yet again with Universal Studios to bring the classic 1933 film, The Invisible Man, to life in pokies form and the result is phenomenal. Previous partnerships between these two companies has brought us ground breaking online pokies titles like Scarface, Frankenstein and Creature from the Black Lagoon. The Invisible Man sets to trump them all, with a visual quality that will leave jaws on the floor. The movie that the game is created from is an eerie tale based on the science fiction novel by H. G. Wells. It follows a chemist who discovers a drug that gives him the power of invisibility, but all hell breaks loose when the drug has unforseen side effects that cause him to lose his mind. As the chemist desperately tries anything possible to restore his visibility, he becomes quite dangerous and terrorises the town in the process. The movie was huge in its day, inspiring many sequels and pioneered cinematic special effects which are still used in movies today. It’s a slightly disturbing story with just the right amount of humour, and an odd yet ingenious idea for another spectacular collaboration between NetEnt and Universal Studios. It uses a five reel, three row format with 20 fixed pay lines and a huge range of bonuses including wilds, re-spins, free spins, walking wilds and two ridiculously awesome bonus rounds. 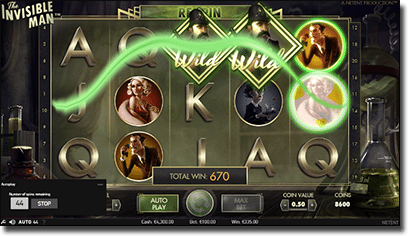 With so many exciting features, The Invisible Man presents a lot of ways for real money players to bring in some sweet cash prizes, while the game quality is so stunning that users playing for free will still enjoy the thrills of the game. Minimum bets start at 20c with a maximum bet of $100.00 and the game is optimised for play on PC, Mac, smartphone and tablets. From the moment the intro starts on this game, you’ll know you’re in for a treat. The use of black and white graphics and creepy sound effects create a haunting atmosphere that adds an intriguing element of suspense. Once the game starts the reels are overtaken with animated characters unrivaled with any other online slots game, with melancholy colour tones adding to the eerie ambiance that makes this game so exhilarating. NetEnt used the best in HTML5 technology to create an outstanding game that has set a whole new bar for the competition. The Invisible Man is just another reason why the NetEnt and Universal Studios partnership is a match made in pokies heaven and provides an exciting sign of the direction where future collaborations are heading. Simon Hammon, Chief Product Officer of NetEnt, sounds as pleased about this ongoing partnership as we do. In a recent statement he said, “Partnering with Universal Partnerships and Licensing has enabled us to deliver another outstanding slot accessible by desktop and mobile devices. 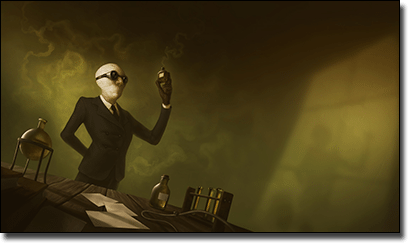 The Invisible Man showcases a great player and gaming experience of a very popular title and story. NetEnt’s use of HTML5 for both desktop and mobile on this fantastic production continues to showcase our abilities, and our innovation in driving the casino market forward.” We couldn’t agree more. Those online gamblers who like their games full of bonus rounds and endless possibilities won’t be able to get enough of The Invisible Man, while the rich graphics alone are enough to spin those reels for hours on end. To experience The Invisible Man pokies for yourself, head to Guts Casino, Thrills Casino and G’Day Casino where you can also find other collaborative titles from NetEnt and Universal Studios. The Invisible Man pokies can be played at these leading online casinos for free play or real money wagers payable in Australian currency, and it’s 100% legal and safe for Aussie players to play. Players can also try their luck at recent NetEnt pokies releases like Cosmic Fortune and Jack and the Beanstalk to experience the full impact of how insanely talented the Net Entertainment team is.